Mitragyna Speciosa, otherwise known as Kratom, is a controversial mind altering natural drug, which is used and marketed as a nutritional and/or dietary supplement. At low dosages, Kratom offers a stimulant effect whereas, at high dosages, it produces similar effects to that of morphine. As we know, Kratom works at the opioid receptors, altering the chemistry in the brain and thus affecting it’s normal level of function. 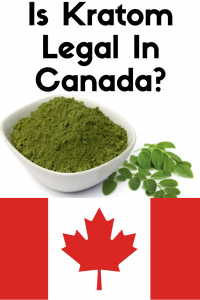 Governing bodies, over the use of substances like Kratom, such as the Canadian Food Inspection Agency, claim that with prolonged use, there is a great potential for dependency and addiction. At the moment, the debate around Kratom legality in Canada is growing. As of present, Kratom in canada is allowed and quite easy to purchase. It has not yet been ban or classified as an illegal substance but who knows what the future will hold. We’ll briefly touch on why several governing bodies in Canada feel that Kratom should be a banned substance, along with the other half of the debate as to why many people believe it should continue to remain legal. Also, we’ll clarify what exactly the classification of Kratom is right now and the regulation around it. Even though it is legal, it can only be bought and sold under certain conditions so keep on reading to find out what these are. In Canada, the governing bodies around controlled substances are the Canadian Food Inspection Agency (CFIA) and Health Canada. The Canadian Food Inspection agency is a scientific based regulator. Their mission is of ‘safeguarding food, animals and plants, which enhances the health and well-being of Canada’s people, environment and economy.’ On the other hand, Health Canada is predominately the governing body which establishes standards to regulate the nutritional quality for all food sold in Canada. Food sold within Canada must comply with the Food and Drugs Act and Regulations and the Consumer Packaging and Labelling Acts and Regulations. In addition, all commodity specific regulations must also be complied with. Health Canada, first determines the product classification, deciding whether the item is a Food or a Natural Heath Product (NHP). In order to determine the classification of a product, Health Canada looks at its composition, product representation, product format, and the perception of history of use. Once the product has been classified, the correct regulatory framework can be applied. Products falling under the classification for food will follow the Food and Drug Regulations applied by the CFIA. They will handle all compliance and enforcement requirements relating to the food item. If the product is a NHP, regulations specific to Natural Health Products, enforced by Health Canada, will be applied. So what is the herb kratom classified as? More on the Kratom legality in Canada in our section Legal or Not. According to Health Canada, Kratom (Mitragyna speciosa) is ‘’a herbal product that may pose serious health risks when swallowed or inhaled. Side effects include drowsiness, nausea, vomiting, seizures, liver toxicity and excessively rapid heartbeat.’’ In addition, Health Canada also claims that Kratom has been linked to both narcotic and stimulant-like effects.They suggest that Kratom exhibits the potential for abuse and dependence. Although classified as a natural health product, Kratom has not been authorized by Health Canada for sale. According to the CFIA and Health Canada, the sale of Kratom for consumption is illegal. Anyone selling the product as such, may face penalties, including criminal prosecution. This is a grey area because of the fact you can easily get your hands on Kratom if you know what to look for, therefor it would seem that the consumption of Kratom itself isn’t illegal. Simply put, Canada does allow the use of Kratom although, according to the governing bodies and laws around the organic product, Kratom has only not been authorized for internal use. Many vendor are getting around Kratom legality by labeling their packaging as, ‘Not for Human Consumption’ and advertising it as use for ‘soap making and aromatherapy’, ‘research’, or ‘spirituality’. Anyone planning to sell a health product in Canada must make sure the item has been authorized first. As of present, Health Canada hasn’t authorized any product containing Kratom hence why it remains illegal to sell the product. The governing organization advises that Kratom products are not safe for human consumption due to the potential adverse effects. The debate on Kratom legality seems to be continuous. You can identify an unauthorized product by whether it has a product code on its packaging. This code with be a 8 digit identification number (DNI). Natural products will have a Natural Product Number (NPN) whereas Homeopathic products, a Homeopathic Drug Number (DIN-HM). What is the punishment for selling Kratom? At this time, It is not clear what the specific fine or punishment is for those selling Kratom. What we do know though, is that the initial action taken by Health Canada and the CFIA when they have found Kratom a vendor selling Kratom, is to order the seizure of the product. Following this, the vendors could risk closure and criminal prosecution for selling such unauthorized products. Why Should Kratom Be Illegal/Iegal? Organizations who are aiming to ban Kratom are making claims without having sufficient research to back them up. As it stands, supporters of Kratom continue to call for more research to explore the benefits of Kratom as a natural pain killer and botanic dietary supplement. Lately, those opposed to legalization are saying that Kratom has all the properties which make it act like an opioid, interacting with the same receptors heroin and morphine would. Their response to the Kratom legality debate is that the risks outweigh the benefits. On the other hand, those wanting to keep Kratom in Canada legal are offering up different claims. They say that research shows, the effect of Kratom is very weak in comparison to the drugs mentioned above, up to 60 times less potent, with much less chance for abuse. Understandably, we cannot deny that Kratom has narcotic effects. The substance acts like an opioid drug, which is why many claim it is also highly addictive. Presently, research has yet to display solid evidence proving there are health risks and abuse potential. The majority of claims are based off theories on how Kratom works in the brain. Together with the Canadian Border Services Agency, Health Canada is attempting to stop products with Kratom from entering into Canada. Even though Kratom exhibits similar properties as opioids, there is simply not enough evidence supporting that it is unsafe. There is also not enough research being done around Kratom, to confirm the risks associated with taking the herbal. The substance continues to remain legal in Canada as long as it’s not being sold for human consumption, which means that if you’re looking to purchase Kratom, you still can, although who knows for how much longer. Kratom products labeled safe for ingestion continue to remain unauthorized by Health Canada. Vendors who sell unauthorized products face a risk of prosecution. If you are in support of Kratom and would like to have the product remain legal, here’s how you can help. It’s part of your duty to take steps towards eliminating the stigma around it. The best way to accomplish this is by making sure that you and those around you aren’t abusing Kratom. The more responsible usage exhibited, the more positive attention Kratom will receive. The result of this is inevitability a higher likelihood more positive publicity will begin to circle around Kratom. The residual effect will be that more research and funding will open up around the efforts to keep Kratom legal and hopefully Health Canada will take note, authorizing its sale. With that said, remember to use responsibly and continue to spread the word on the benefits you receive from Kratom consumption! You can stay updated on whether Kratom does become authorized for sale by Health Canada by clicking here and searching for Mitragyna Speciosa. As always, check back often for updates to this article, including recent recalls, news reports, and new research studies. Two questions not addressed in the article, or in the Netflix documentary ‘Leaf Of Faith’, which I just finished watching. One, is their a tolerance issue with kratom uses as there is with cannabis, opioids and other substances? And, two, are there test kits for sale that can confirm the purity of kratom products? I have purchased some Kratum in the U.S.. Is it legal to bring it home to Canada? You will not be permitted to bring anything except capsules across border. As for tolerance, I believe it is personally specific. But I’ve had some and I’ve shared with friends who are in dire pain and they think it will be fantastic. I leave for Canada in two days and I want to bring some Kratom with me. What should I do? Should I bring it in capsules or should I leave it in powder form? Someone needs to proof read better. Is there a minimum age to purchase Kratom in Canada? You must be 21+ of age to purchase Kratom in Canada, based on any correspondence we could find.